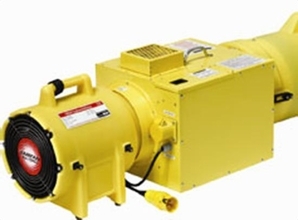 Ramfan HA01-100HT is a high performing Inline Heater for confined spaces, command centers and rescue shelters(115V, 60Hz). This UB20 8 inch heater delivers up to 70,000 BTU�s of safe, warm breathing air with its propane-fired, heat-exchanger for up to 10 hours. Order includes Remote thermostat and Quick-Couple Canister with 15 ft (4.6m) duct.